MamaBreak: 10/1: Mmmmm . . . Monday! Homemade Play Dough! This week is all about Halloween and getting you ready for the big event! We love to trick or treat! We especially love handing out treats, but I like to hand out things that are unique. I also send "treats" to my children's classrooms each year, and that can get quite expensive . . . so I like to get creative. 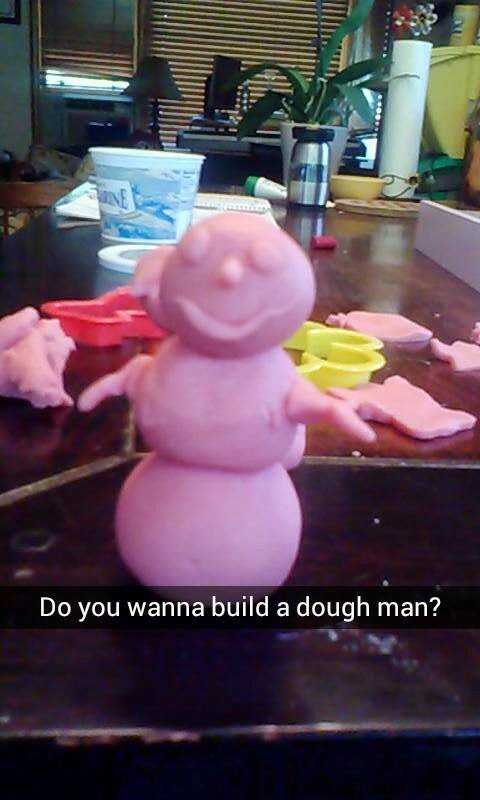 One of my favorite things we would make in my home as a child was play dough. It is VERY easy to make, and lasts for a long time. Really, you can use almost anything-- as long as the play-dough can easily come out of them. If you are just making it for your home use, any plastic or glass containers will work. Mix the dry ingredients first in a large bowl. Then, in a small bowl mix the liquid ingredients. Add the liquid ingredients to the large bowl of dry ingredients. Place the mixture on a cutting board and knead the dough until you reach the consistency for play dough that you would like. I separate the large batch into smaller batches in small glass bowls and add a different color of food coloring to each. You can make larger batches and add food coloring as you see fit. These are so fun to hand out as "treats" for trick or treat. We add little labels to ours, or paint the yogurt cups to make them look more "Halloween." There are variations on the recipe above. My mom taught me the alum method, which I have been using since I was three. However, many people replace the food coloring with Kool-aid, and if you do not have alum, you can replace it with 1 teaspoon of cream of tartar. If you substitute cream of tartar, you should use 2 cups of warm water (rather than 1). I totally forgot about this recipe! I used to make it all the time when I was teaching! Thank you!! Now I can make it again with my son! He'll have a blast! I used to make this with my daughter...how fun I miss those day! Sounds like a lot of fun for Halloween! OOOH I had no idea you can make play doh at home! Thanks for the tip! Hey thanks for this! I'll need to make some now.